I know it’s Cinco de Mayo and everyone in the U.S. is likely celebrating this Mexican-American holiday by, well, imbibing some margaritas and whatnot. But today is also #MeatlessMonday, a trend that I happen to love (and do) very much. 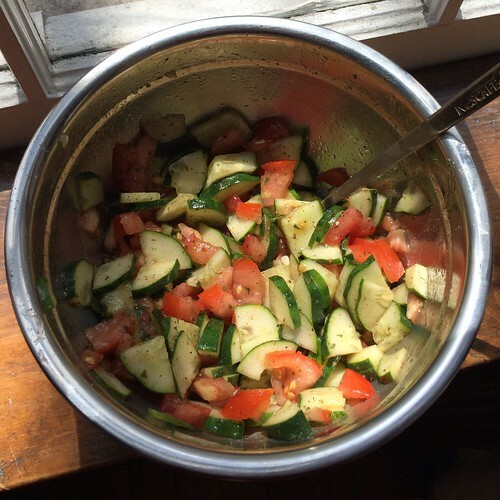 I love eating vegetarian (like my favorite tomato-cucumber salad, which I Latin spice up with cilantro and chili powder) because it allows me to add more vegetables to my diet. And I do mean “add more vegetables” to my diet, not the “I’ll just have a cheese pizza” type of vegetarianism. Instead, I use what is called “crowding in” with my diet–meaning that instead of subtracting the “bad” foods, I simply add a lot more “good” foods and the bad stuff simply doesn’t fit in anymore. February is Heart Health Month and, I don’t know about you, but I can’t help but seeing American Heart Association’s Go Red For Women information everywhere I turn. With heart disease being such an important topic in the Latino community, you can bet I’m noticing what’s being said – and one of the words of wisdom is coming from chef Ingrid Hoffman. The star of Simply Delicioso on Food Network and author of the new book Latin D’Lite, I was lucky enough to sit down with the famed Colombian-American chef to talk about my (and her) favorite topic: healthy eating made easy for Latinos!